Government-run parks cover too little of Kenya’s territory to sustain the country’s wide-ranging wildlife populations, nearly two-thirds of which depend on open rangeland that indigenous herders also use. Today, herders and wildlife must navigate pastures that are increasingly crowded, fragmented, and fragile. Livestock numbers have increased dramatically, while wildlife populations have declined precipitously. The South Rift Association of Landowners (SORALO), a collective of Maasai-owned group ranches spanning 10,000 square kilometers (3,800 square miles), formed to protect the free movement of both people and wildlife on its terrain. While SORALO’s monitoring suggests its efforts are yielding results, South Rift communities face an extraordinarily complex future, and the goal of coexistence between herders and wildlife does not come easily. OLKIRIMATIAN, Kenya — As night falls on the Olkirimatian Group Ranch, in south-central Kenya, a cacophony of whistles and cowbells fills the air. Herders are hurrying cattle, sheep and goats home for the evening. By day, Maasai pastoralists and their livestock rule this stretch of Africa’s Great Rift Valley. But each night, people here still beat an age-old retreat, ceding the land to its other, wilder owners. Many international tourists think of Kenya as a country defined by a few famous, people-free protected areas. In reality, Kenya’s government-run parks cover only 8 percent of its territory, an area too small to sustain the country’s wide-ranging wildlife populations. Nearly two-thirds of Kenya’s iconic animals depend on open rangeland areas like Olkirimatian, where mobile wildlife live alongside mobile herders. In recent decades, however, a sweeping set of pressures, including human population growth, the breakdown of traditional pastoral practices, new fences, and development, have begun to transform Kenya’s open range. Herders and wildlife today must navigate pastures that are increasingly crowded, fragmented, and fragile. A 2016 paper found that livestock numbers had increased dramatically in Kenya’s rangelands since 1977. Meanwhile, wildlife suffered “relentless, pervasive and catastrophic” losses, with populations of counted species declining by an average of 68 percent over the same period. The Lale’enok Resource Centre, on the Olkirimatian Group Ranch, is headquarters to an organization aiming to halt these trends. The South Rift Association of Landowners (SORALO) is a collective of 16 Maasai-owned group ranches that have come together to protect the free movement of both people and wildlife in southern Kenya. Though some SORALO-owned lands have been fenced, most are a relative holdout against the changes on other Kenyan rangelands. Spanning about 10,000 square kilometers (3,800 square miles) between Kenya’s Amboseli National Park and Maasai Mara National Reserve, the SORALO territory is home to a quarter of a million people and some of the planet’s most diverse and abundant populations of large mammals. A map of southeastern Kenya shows the location of South Rift Association of Landowners (SORALO) lands, a collective of 16 Maasai-owned group ranches (click here to enlarge). Image courtesy of SORALO. Lions rest on a termite mound in the SORALO landscape. Image by Guy Western. SORALO’s director, John Kamanga, comes naturally by a pastoral worldview. Sporting a trim blazer and speaking sometimes in the lingo of his education in organizational management, he fits in well with Kenya’s hustling community of social impact leaders. But Kamanga is also a Maasai who served as chair of the Olkirimatian Group Ranch for 16 years and still keeps cattle in the South Rift. In SORALO’s Nairobi office, four hours from its territory, Kamanga and the group’s research coordinator, Samantha du Toit, run me through the organization’s history. Founded in 2004, SORALO began as a way to scale wildlife tourism projects that Kamanga and others helped start on the Olkirimatian Group Ranch and the neighboring Shompole Group Ranch. The idea was to create a South Rift circuit for tourists transiting between southern Kenya’s national parks. Today, however, SORALO’s mission is more fundamental. While the organization continues to help member communities develop tourism projects, its focus is on sustaining the bedrock resource — a “healthy and intact landscape,” as the group’s promotional materials put it — upon which both herders and wildlife rely. 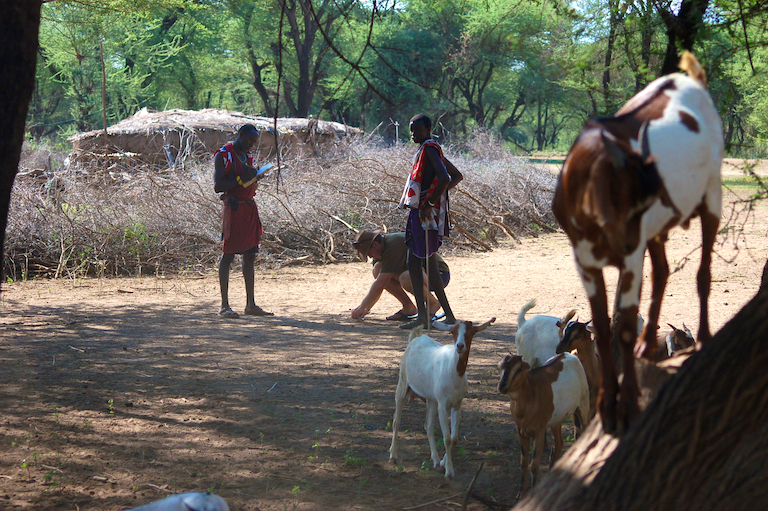 SORALO’s Guy Western and Loserem Pukare measure and record lion tracks outside a homestead in Olkiramatian, Kenya. Image by Guy Western. To do so, SORALO takes a three-part approach. To keep lands open, SORALO helps communities deploy land-use planning and legal tools to strengthen their rights to their land. 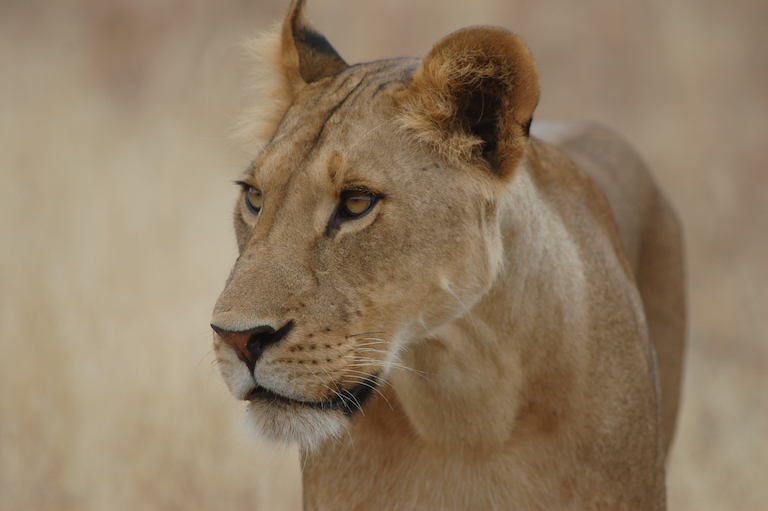 To help communities manage their natural resources more effectively, SORALO employs a large network of community game scouts, a rangeland monitoring team, and a lion-conflict mitigation team called Rebuilding the Pride. And to help communities benefit more from those resources, it builds their incomes by developing wildlife tourism ventures and supporting a livestock marketing and production program and a women’s enterprise program. The point, SORALO staff emphasize, is to demonstrate that development doesn’t have to come at the cost of open landscapes, wildlife and an intact culture. SORALO programs focused on introducing land-use planning and adaptive rangeland management concepts offer part of a solution. Importantly, SORALO isn’t starting from scratch: the South Rift Maasai maintain several traditional systems for managing communal resources. The Olkirimatian and Shompole communities, for instance, employ rules that determine when and where herders can graze, as well as reciprocal grazing arrangements with outside communities. The final plank of SORALO’s work focuses on documenting and helping communities sustain their traditional practices. In fact, Kamanga says, SORALO’s “inside-out” approach to conservation is what most distinguishes it from other community-based conservation initiatives in Kenya. Rather than imposing outside conservation values on communities (an “outside-in” approach), SORALO uses traditional systems as the basis for its work. A Maasai herder moves cattle across rangeland shared with zebras. Image by Guy Western. In the 2012 book Savannas of Our Birth: People, Wildlife, and Change in East Africa, Colorado State University conservation scholar Robin Reid describes the relationships between East African pastoralists and wildlife as a spectrum stretching from conflict to coexistence. At one end, conflict occurs where pastoralists and wildlife compete for resources or harm one another. But coexistence, where pastoralists and wildlife benefit each other, is also possible. For instance, herders might play a role in keeping land open for wildlife, even as wildlife brings in tourism dollars or draws predators away from livestock. Much of SORALO’s work centers on understanding this conflict-to-coexistence spectrum in the South Rift, and on finding solutions that tilt the scales toward coexistence. “We’re very focused on the question of where does it go right and where does it wrong,” says du Toit. 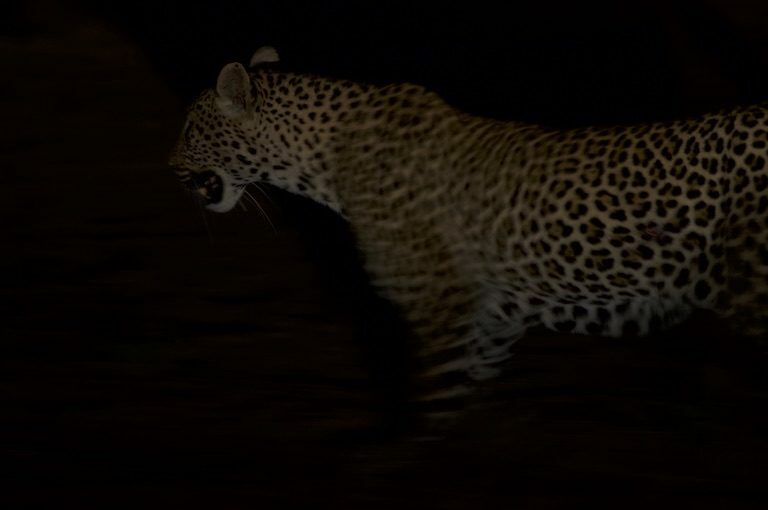 A leopard on SORALO lands. Image by Guy Western. One night I join SORALO’s Rebuilding the Pride team for an excursion through the Olkirimatian and Shompole group ranches. Guy Western, who coordinates a SORALO program called Coexistence for Conservation, is at the wheel, navigating a Land Cruiser through stands of acacia trees and across moonlit expanses of grassland. Peter Meiponyi and Patrick Nkele stand on the back seat, their upper bodies sticking out of the sunroof, and use a spotlight to scan for flashes of eyes. The beam pauses only briefly on zebra, wildebeest, giraffe, gazelle. Tonight, the team is after rarer quarry. We’re looking for eyes that stare forward and glow golden-orange, like small nuclear reactors: lion eyes. The team’s search is part of a nationwide effort. Across Kenya, a coalition of NGOs is conducting the country’s first detailed lion census. I’m tagging along to learn how people share landscapes with animals like lions in the first place. It’s a question Western has spent his career considering. A Kenyan conservation scientist, Western recently completed his Ph.D. at Oxford University, where his dissertation asked how different contexts, from political situations to cultural traditions, affect the way people across Africa get along with lions. Wildebeest and livestock share the range on SORALO lands. Image by Guy Western. A number of cultural factors help explain the trend toward coexistence in the South Rift. The most obvious is the Maasai’s cultural prohibition against eating wildlife in all but the most extreme circumstances; generally, the Maasai attitude toward wildlife is live and let live. But there are also subtler dynamics at play. The South Rift region is among a few places in Kenya where pastoralists still employ a traditional seasonal movement system. SORALO’s research shows that the system creates a heterogeneous landscape with rotating areas of different kinds of pasture and habitat that reduces conflict between wildlife and livestock. On a finer scale, individual Maasai herders are adept at avoiding livestock predation and far more tolerant of it than, say, ranchers in the U.S.
SORALO’s efforts are also contributing. The community game scouts serve as a human-wildlife conflict rapid response team, helping to cool tempers and prevent retaliation when lions take a cow or an elephant hurts a person. And while young Maasai men have traditionally hunted lions as a rite of passage, the practice is ebbing in areas where Rebuilding the Pride works. The Rebuilding the Pride team is zooming across the Shompole Group Ranch when Peter Meiponyi whispers: “Simba!” A young lioness lies in a patch of moonlight watching an upwind herd of wildebeest. Western knows this lioness, and the sighting elicits a story. Last year, a group of young Maasai warriors from another area came to Shompole to graze their livestock. Noting the number of lions in the area, the outsiders criticized the local warriors for not being man enough to control lion numbers. Eventually the goading resulted in a traditional hunt, in which the mother of the lioness we found was killed. While the story suggests the difficulty of SORALO’s work, it’s also a story of progress. The outsiders visiting Shompole noticed the lions because there are more here than there once were — a sign, ultimately, of an expanding culture of coexistence. SORALO staff members Loserem Pukare, left, Patrick Nkele, center, and Payakuoni Kitesho, right. Image by Guy Western. While SORALO’s monitoring suggests its efforts are yielding results, South Rift communities face an extraordinarily complex future. Human populations are projected to continue increasing across East Africa’s rangelands, even as traditional practices erode and fences proliferate. Of SORALO’s 16 member ranches, nine have subdivided, meaning community members voted to divide communal lands into individual parcels. The appeal of subdivision is that it gives families secure tenure to their own piece of land; the paradox is that no pastoral family can sustain itself on a single parcel of land. Changes to Kenya’s rangelands add up to changes in peoples’ relationships with wildlife. As herders move more livestock through smaller, more degraded areas, more conflict with wildlife is inevitable. On a deeper level, some observers argue that SORALO’s pastoralist-led model is fundamentally flawed, destined to be overwhelmed by the changes coming to Kenya. “To romanticize pastoralism is a fallacy. Pastoralism is driving much of our decline in wildlife,” says Dino Martins, executive director of the Mpala Research Centre in central Kenya. Martins says that exponential increases in livestock populations across Kenya are currently driving a range of ecological issues. He points out that multiple studies have shown that Kenya’s rangelands are already badly overgrazed and current conservation efforts are failing to slow losses to wildlife and plant diversity. Lions near Shompole Hill on the Shompole Group Ranch. Image by Guy Western. As for the authors of the 2016 paper charting Kenya’s wildlife declines, they note that the country is switching from an “empty world” with enough space for wildlife and people to a “full world” of increasing conflict. The authors see pastoralists-led conservation efforts like SORALO’s as a necessary, but insufficient, response to Kenya’s conservation challenge. Ultimately, they say, stronger government policies are needed to support local management of wildlife. For their part, SORALO staff say they are advocating for and helping herders navigate new government policies that support coexistence. SORALO staff also acknowledge that their strategy involves trade-offs between the needs of wildlife and the needs of people. “Obviously if you are trying only to maximize wildlife, this is not the right approach,” says Guy Western. One morning I join Western and Steiner Sempeta, SORALO’s data manager, for a trip to the Loita Hills. 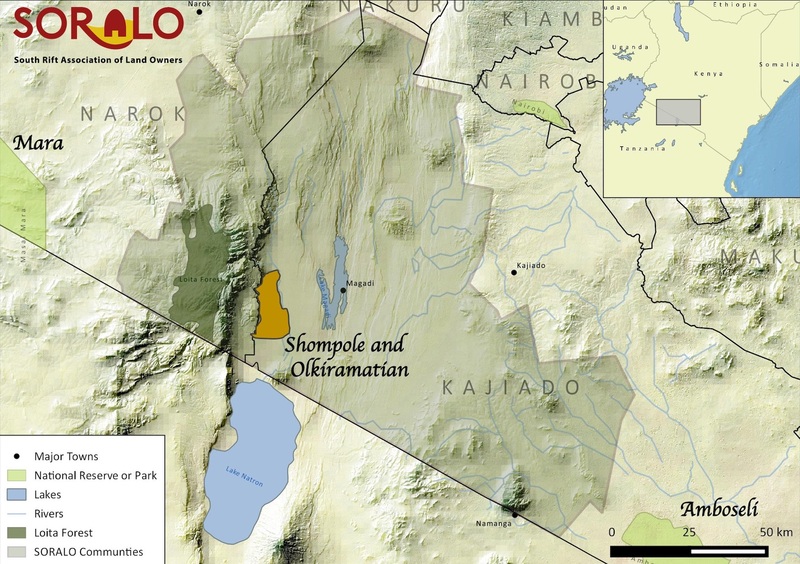 Just west of Olkirimatian and Shompole, the Loitas are known as a stronghold of traditional Maasai culture, and for the old-growth Loita Forest, which remains intact largely because of cultural rules. As we travel across the plains leading to the Loita Hills, Sempeta and Western narrate the landscape. To the right is the past of Kenya’s rangelands, an open expanse of whistling thorn and grass stretching away to the horizon. To the left is one possible future: a sub-divided, fenced-in landscape. Sempeta and Western note that the fence posts are cedar — trees taken from the Loita Forest — and that a major wildebeest migration through the area has recently all but stopped. We camp in the shadow of the Loitas, in the company of a number of SORALO community game scouts and Kenya Wildlife Service (KWS) rangers. Over dinner, a young KWS ranger shares tales of life in Kenya’s wilds. His favorite post was Tsavo East National Park, because it was simple; there, poaching was his only problem. Now that he works in community lands, he has to attend to the thornier issue of human-wildlife conflict. A 14-year-old girl was just killed by an elephant, he says; not long ago, it was a 42-year-old man. Coexistence doesn’t come easy. SORALO’s work in the South Rift is messier than conservation in protected areas, where human activity is largely excluded. But in Kenya, as in other parts of the world, it will be the shared spaces beyond parks that determine the future of wildlife, and of people’s relationship to wildlife. Earlier in the evening at our camp with the KWS rangers, the familiar sounds of whistles and bells — herders driving their animals home — came floating down Loita Hills. Now, as the Milky Way arcs across the sky, hyenas take over. They’re somewhere not far off, whooping in the dark. A lioness named Ngiso. Image by Guy Western. 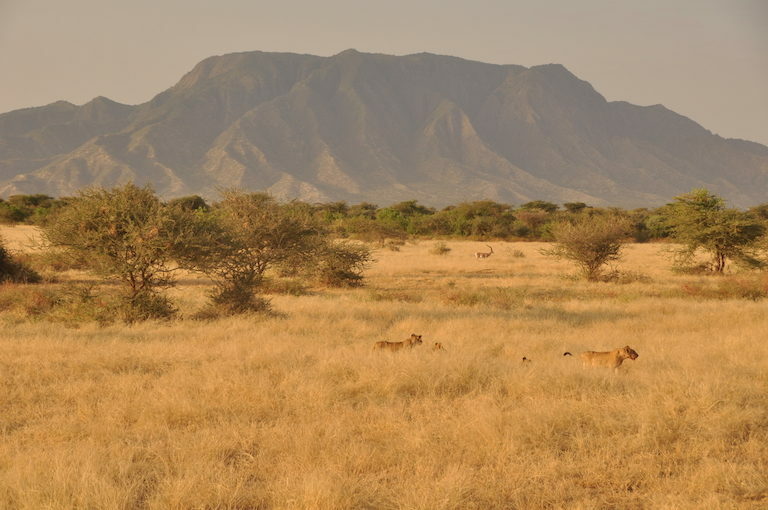 Banner image: Loserem Pukare, who works for SORALO’s Rebuilding the Pride lion conservation program, looks for lions on the Shompole Group Ranch in southeastern Kenya. Image by Guy Western. Editor’s note 3/1/19: At Dino Martins’s request, this story was updated after publication to clarify the explanation of his views. Ogutu, J. et al. (2016). Extreme Wildlife Declines and Concurrent Increase in Livestock Numbers in Kenya: What are the Causes? PLoS ONE 11(9): e0163249. Russell, S., et al. (2018). Seasonal interactions of pastoralists and wildlife in relation to pasture in an African savanna ecosystem. Journal of Arid Environments 154:70-81. Western, D., et al. (2009). The Status of Wildlife in Protected Areas Compared to Non-Protected Areas of Kenya. PLoS ONE 4(7): e6140.